Tamsin This is one of my ideas, for what it's worth. The Deadweight Value of Thickness is what you can expect to earn from some thickness simply by virtue of its being there, without you directly attempting to use it. This would be the minimum return to be expected from that thickness, while the Potential Value of Thickness would be the maximum. If one could find some way to estimate these values then it could be very handy in assessing an exchange. For example, if the deadweight value of the thickness gained from ceding the opponent some territory exceeds the value of that territory, then you can be certain that the trade is favourable. NOTE I did see on one of Steve Fawthrop's (or was it Dieter's? )KGS/Wings talks an idea for counting thickness in which one claimed all vacant points within 3 points of the thickness, using Manhattan distances. Perhaps this could give one some idea of the thickness's deadweight value? Bill: No, it's worse than that. The deadweight value can be negative (see Wall Death). The eye potential of any thickness is very important. Also, sometimes it is best to sacrifice thickness. In such a case, do you consider the deadweight value to be negative? Tamsin: If a wall has no eyes and undergoes Wall Death then could it ever have really been called thickness? Real thickness must have a minimum value. This value might be realised in unexpected ways, for example by sacrifice. Perhaps the kind of "thickness" that suffers wall death for no compensation (a case of mochikomi) ought to be called false thickness. BobMcGuigan: A group can be thick without being alive. Thickness refers to strength, and a group can be strong without being absolutely alive. Take Charles's example in the diagram below. The black wall has no eyes. A group that is thick would normally be expected to be fairly safe. One mistake that's often made is to confuse a heavy group for a thick one. Maybe that's some of what you are thinking of in false thickness? Tamsin: Charles's example is indeed not yet alive but also clearly thick. It could become heavy under the wrong circumstances, but supposing that it does not become lost through outright bad play, then it ought to earn at least something, and that something is what I meant by deadweight value. By false thickness I do mean heavy groups that can look, at first glance, like thicknesss, but I also mean the kind of thicknes with cutting points and shape defects, which can sometimes be quite difficult to exploit (requiring a tesuji). I hope nobody objects to my (at best a UK 1 dan in strength) making up terms such as deadweight value, potential value of thickness, false thickness and so on. Largely for my own benefit I create terms for ideas that I have encountered but for which have not been able to find existing terminology. If it happens that other people might find a use for my neologisms, then that would be very satisfying. Charles It becomes difficult to defend the thickness concept if it is used in this way, I think. (See what I wrote at the influence buzzword, and what Bob wrote recently at potential value of thickness about Otake's style, for example.) It makes more sense to call an overall position 'thick' than to try to locate the quality in bits of formations; and shape clearly does matter for that, not just having 'outward facing' stones. Tamsin I see it differently: I find these terms useful for myself, and if others also get some use out of them then everybody's happy. Thanks to all, though, for some interesting comments and for helping me to expand my ideas. Charles It seems reasonable to count these circled points as 'already territory' for Black here, since this fourth line wall is supposed to be just as good as White's third line territory. This is a place to start, certainly. Andre Engels: I disagree. Given that the black position and the white position are assumed equal, and that the black stones clearly have more influence outside the circled area than the white stones have outside the squared area, one has to conclude that black must have less in the circled area than white has in the squared area, and thus certainly not all of it. anyone who knows what to count at the edges knows more than I do. If we are talking about the minimum minimorum then applying chinese scoring seems more reasonable. We have to assume first that the wall on the diagram above lives and the white group on the third line lives as well. Then when filling the territory with stones the space above the wall can be filled only with white stones and that is solid territory (12 points). The centre-facing area by the black wall can be filled either with white or with black stones. If White fills it then Black would get moves elsewhere therefore we can safely assume that they would fill it with alternate moves. So, one can assume that Black has at least a half of the points shown in this diagram as the dame space around the wall. It is 18/2 = 9 points. The other 9 points can be either white's or blacks. So, perhaps one has add a half of this value. One gets 13.5 points then. The shape of the dame zone is a little bit arbitrary here. Perhaps, one can redefine it better. This is only the idea. Charles Well, I'm sceptical about the picture. This is the picture I'd visualise. 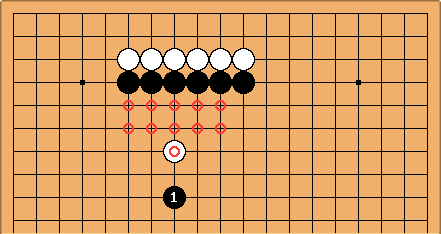 The claim of 'control' for Black (which ought to be as good as Chinese-rules analysis) is that here is the only weak group we can now see; and in a QARTS-type judgement this group is now worth something like -10 points to White, comparable with the number of circled points turned to dame. Charles Actually there might be a general point buried here. The term deadweight expresses quite well the exclusion of the entire gerund sector. And positional judgement does imply an instantaneous picture of the state of the board. The whole 'electrostatic' approach to influence is suspect, in my view; but it is taking on a difficult task, roughly to explain 'the remainder after you subtract haengma'. RobertJasiek: Instead of Deadweight Value of Thickness, a much more accurate approach is to combine current territory, count and quiet, as described in Joseki Volume 2 Strategy, chapter 4.2.